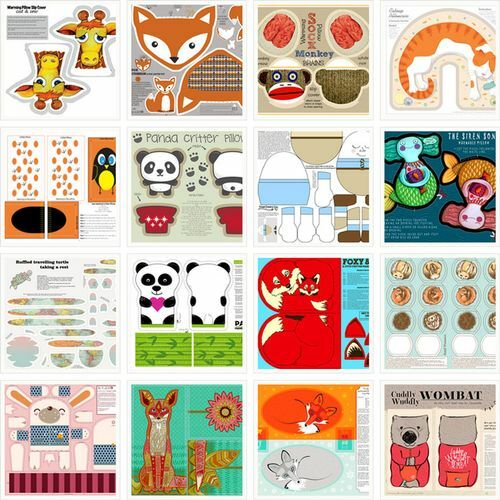 For this week's contest we asked each designer to create a cut & sew pattern for a slip to fit a warmable animal-themed pillow — a pillow that can be filled with feed corn, flaxseed or something similar and then warmed in a microwave to create a soft, snuggly friend for cold winter nights. The entries were almost too cute to vote. 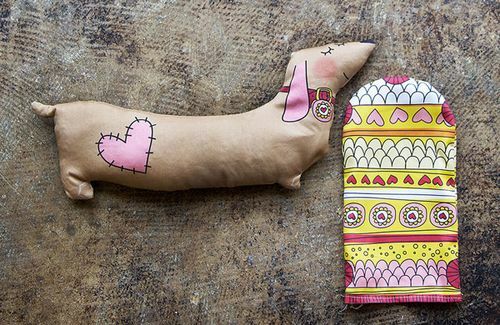 The winner, however, was a little dachshund named Sally created by Australian designer Laura Wright. Congratulations to Laura and the rest of the top ten! A few weeks ago, we posted a tutorial for sewing a warmable pillow — a small pillow filled with dried rice or corn that can be microwaved and used for snuggling. For this week's contest we asked each designer to create a cut & sew pattern to make a removable cover for one of these pillows using a favorite animal as a theme. 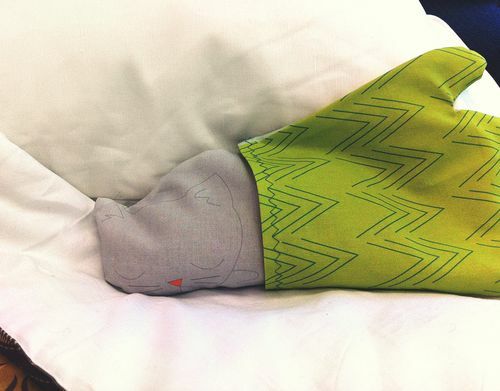 The pattern had to fit on a fat quarter of fabric and include cut lines, seam allowances, etc., to allow someone who orders the pattern to understand how to create the pillow cover. Back in the day, one might have used a hot water bottle covered in a washable knitted or sewn cover to keep warm on a cold night or to soothe tired muscles. These days, little pillows filled with wheat, rice, or another grain that you can warm in a microwave are available for this purpose–and are presumably much less messy than a hot water bottle if they happen to spring a leak! Stephen and I introduced our young daughters to the habit of snuggling with a warmed wheat critter pillow at bedtime this winter, and they’ve been absolutely thrilled with this extra bit of coziness at night. So to spread the coziness around, we recently announced a critter pillow slip cut and sew pattern as a contest theme. (The deadline for entry is Tuesday, February 19.) Spoonflower staffer Kelsey designed her own tiny, snuggly critter and co-worker Becca stitched it up and wrote a how-to. Read on below for the details of their adorable joint project! normally have won and to donate it instead to the Red Cross. extra layer of festivity to your next party. 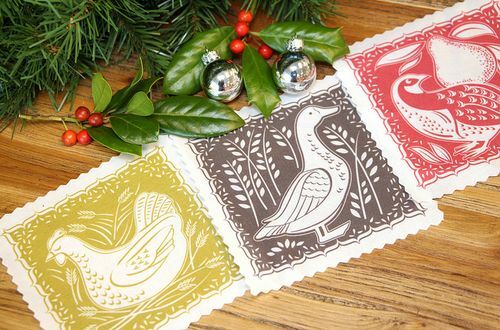 [Read more…] about Holiday Cocktail Napkins, Anyone? If you followed the contest this past week, you know that we challenged designers to come up with cut & sew patterns for quarter-yard pieces of fabric. The goal was to create a set of fun projects for the folks planning to attend a local event as part of Etsy's 2012 Craft Party. The winner this week is a first-timer who created a charming set of stuffed fabric finches: Shel of PotBellyBears. Way to go, Shel! Cut & Sew Projects for Etsy’s World Craft Party – Vote for your favorites! 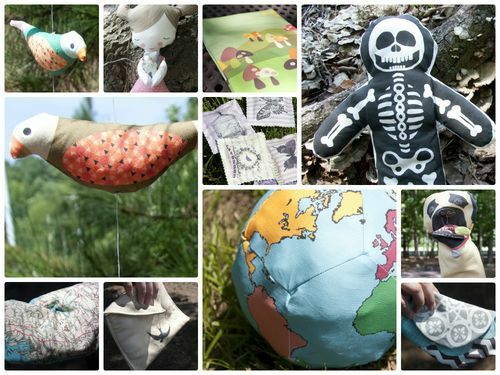 On August 24th, our friends over at Etsy will host their 2012 Craft Party, a global celebration of meeting and making. 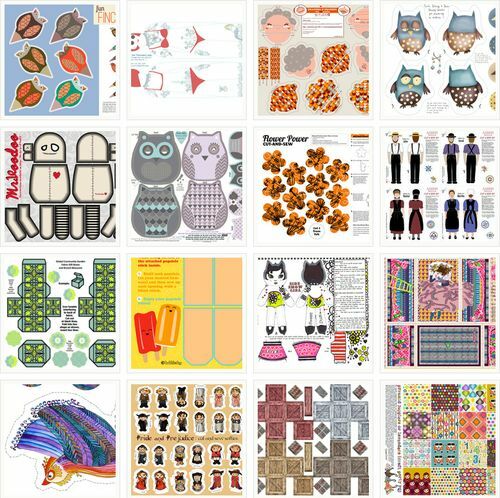 Crafty souls from all over the world will be coming together in small groups to make cool stuff, so we decided to ask our community of designers to create fat-quarter-sized cut & sew projects that craft partiers could work on together. It’s up to you to vote for your favorites, but the winner will be featured in the How-Tuesday series on the Etsy blog! [Read more…] about Cut & Sew Projects for Etsy’s World Craft Party – Vote for your favorites!